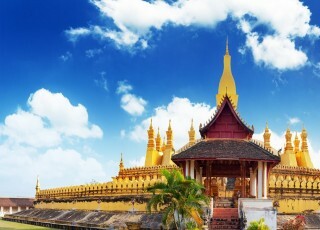 This is the big tour of Laos, demonstrating the huge variety of sights and activities the country has to offer, and showing you just how to spend two unforgettable weeks in this enchanting country. On arrival at the airport, you will be met and transferred to check in the hotel. After a soft rest, your city tour begins with a visit to the magnificent Wat Xiengthong with its roofs sweeping low to the ground, which represents classical Laotian architecture. 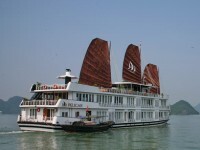 After that, you will visit Royal Palace Museum, which hosts a range of interesting artifacts. 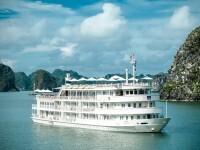 From there, we ascend the 329 steps to the top of Phousi Hill for the panoramic view of the city and the Mekong River. Today, we will first visit the city’s oldest temple of Wat Sene. 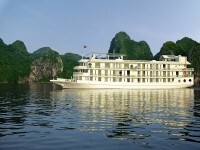 After that, we embark on the leisurely cruise upstream on the Mekong River, which also gives us a breathtaking view of the tranquil countryside, before reaching the mysterious Pak Ou Caves, two linked caves crammed with thousands of gold lacquered Buddha statues of various shapes and sizes left by pilgrims. Along the way, we stop at the village of Ban Xanghai, where they make the local rice wine. An early start gives you the fantastic opportunity to participate in the daily morning rituals of saffron-clad monks collecting offerings of Alms (ubiquitous sticky rice) from the faithful residents. This tradition is very unique in Laos, being the only Buddhist nation still preserving the procession. From there, we will take a short visit to the morning local market near the Royal Palace. At the market, you can find anything from rice, to fresh vegetables, to steamed fish, frogs, and anything else that might be the day’s catch, just set up on the ground, this is what the locals do every day. 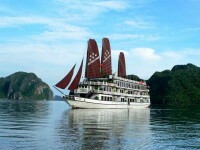 This is really the chance for you to get a real flavor of the local culture. 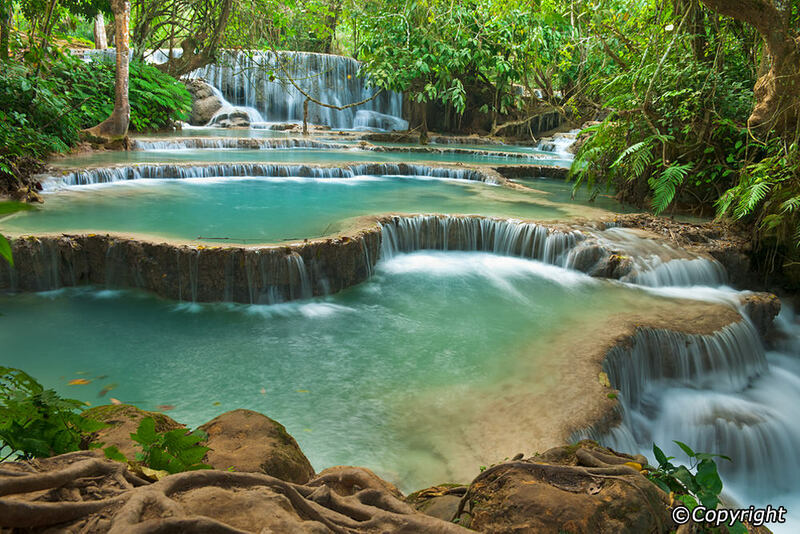 After breakfast, we transfer directly to the beautiful Kuang Si Waterfall where you can cool off with a refreshing swim in the pools or walk along the forest trails. Before returning to Luang Prabang, we stop to visit the Kuang Si Falls Butterfly Park (closed on Tuesday, and from 03rd May to 19th June every year), one of the must-visit spots, where you can have an optional 15 minute tour to learn about butterflies and local flora. Laos is also known for its traditional crafts, we will take a short visit to the Ock Pop Tock Living Craft Center, where you will have a short tour so you get information about Silk, about weaver, about the Women that work in the Centre. After breakfast, we will transfer directly to the Elephant Village (start at 8:00 AM in the morning). On arrival at the Elephant Village Camp, welcome and greeting by our camp manager and participate in short briefing about elephants. After that we will enjoy the impressive experience of a 30 minute elephant ride on your elephant’s neck. We then receive basic mahout training on how to control an elephant. Boat trip to the Tad Sae Waterfall: Take a traditional Lao long boat to the Tad Sae Waterfall and relax in the clear water. In the morning, we travel by road south to Vang Vieng. 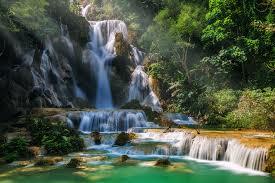 Our intrepid journey will be strenuous as we drive along one of the most scenic region of Laos. The road is now good enough for our drive. Along the way, we will make some stop to visit a local school at Ban Ber Sip, and local villages of H’Mong ethnic groups. After about one hour drive, we will have chance to enjoy the panoramic view at the highest peak of the area, which is more than 2000 meter high. We will have lunch in Kasi (your own account) before continuing to Vang Vieng. 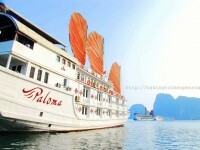 After lunch, we will drive to visit Pha Hom market, where we can find various offer of wild animals. We will also stop at Ban Phouhin Lekphay to see the life of Khmu hill-tribe. 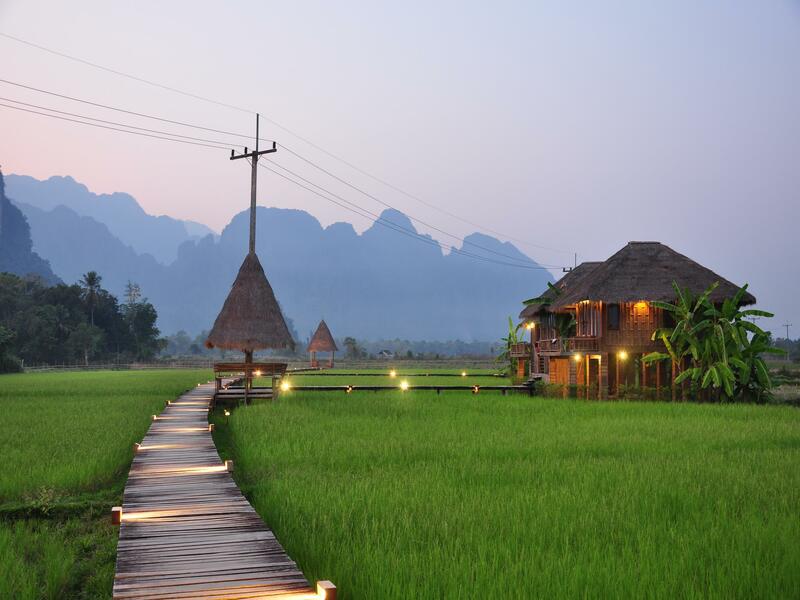 We will make the last photo stop at Phatang Mountain view point to admire the beautiful scenery before reaching Vang Vieng. In the morning, we will first stroll around the town to visit the local market to catch a glimpse of everyday life in a typical Lao rural area. 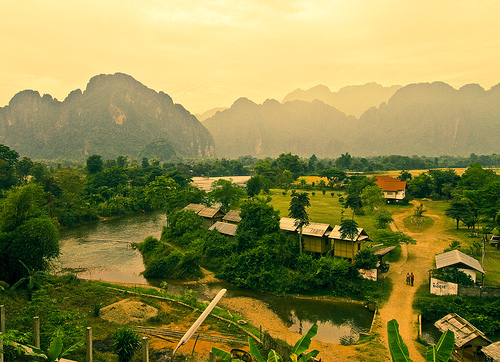 The limestone cliffs and valleys surrounding the resort complex of Vang Vieng are home to numerous caves and caverns. The most famous in Vang Vieng is the cave of Tham Jang, which was used in the early 19th century in defense against the Chinese invaders. 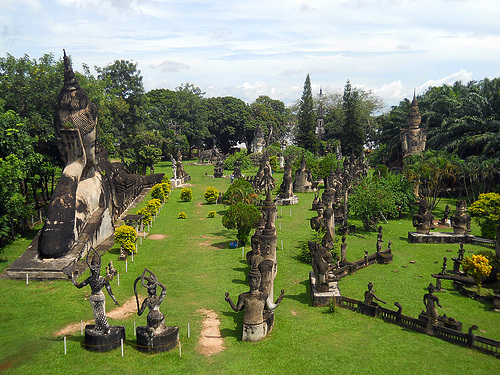 We then transfer directly to Vientiane, the capital of Laos. Located on the banks of the Mekong River, this capital conjures up exotic images, with a curious mix of Lao, Thai, Chinese, Vietnamese, French influences. In the afternoon, we will first visit the major sights of the capital; including the oldest Wat Sisaket, the temple with thousands of miniature Buddha statues and the former royal temple of Wat Prakeo, which previously housed the famous Emerald Buddha Image. On the way to Lao’s national icon, the famous and sacred structure of That Luang Stupa, we stop enroute to take some pictures of the imposing Patuxay Monument, which is well known as Vientiane’s own Arc de Triumph. We are free to stroll around the town before taking the flight to Pakse, the biggest city of the Southern Laos. After breakfast, visit Tha Teng colourful ethnic minority food market. Next explore a couple of fascinating minority villages, Ban Bong Neua, an Alak village that boasts a sacrificial altar, and Ban Kokphung, a Katu village where they keep coffins under their houses. Arrive at the beautiful Tad Phaxuam Waterfall by mid-morning, before leaving the Bolaven Plateau and continuing to Champassak by lunchtime. In the afternoon visit Wat Phou, an ancient Khmer religious complex dating back to the 5th Century. Recognized by UNESCO as a World Heritage Site, Wat Phou is a spectacular pre-Angkorian temple that sits amidst the rice fields and waterways of southern Laos. The temple was constructed in three levels: the bottom level is focused on the baray (water reservoir) and promenade, the second level features quadrangular pavilions and galleries of carvings, and the top level is the sanctuary itself. 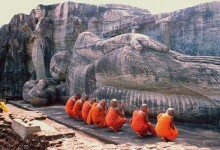 The temple was built by the rulers of the Khmer empire before the construction of Angkor Wat. 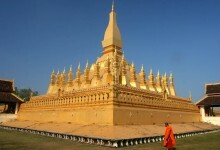 The temple served as the most important economic and political centre of the region and still is one of the Lao people’s most revered temples. 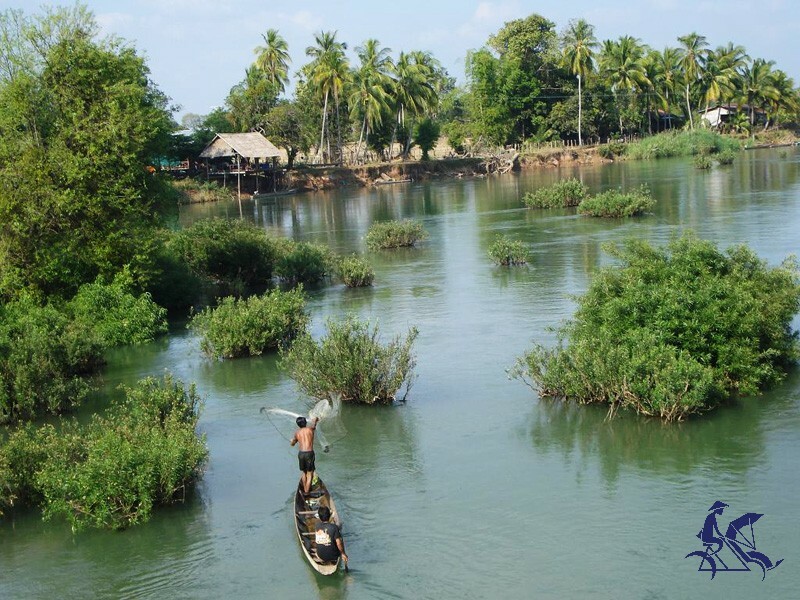 Heading out of town we embark on a long tail boat for venturing into the widest reach of the Mekong River, where during the dry season the waters recede and leave behind thousands of islets, giving this area a lovely name” Si Phan Done”. Upon arrival, explore the local peaceful villages of Ban Khone, where you will see an array of relics from the French colonial era and retrace the old colonial past, including old French colonial buildings and the remnants of the first Lao railway with its locomotive. We continue to discover the 4000 islands area by tuktuk and visit the marvelous Liphi waterfall, also called the "Corridor of the Devil" one of the most beautiful waterfalls marking Lao border with Cambodia. 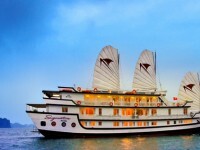 If we are lucky, we may even see the rare freshwater Irrawaddy Mekong dolphin at Ban Hang Khone. We return to the mainland at the fishing village of Ban Nakasang and drive further south to visit Khone Phapheng. 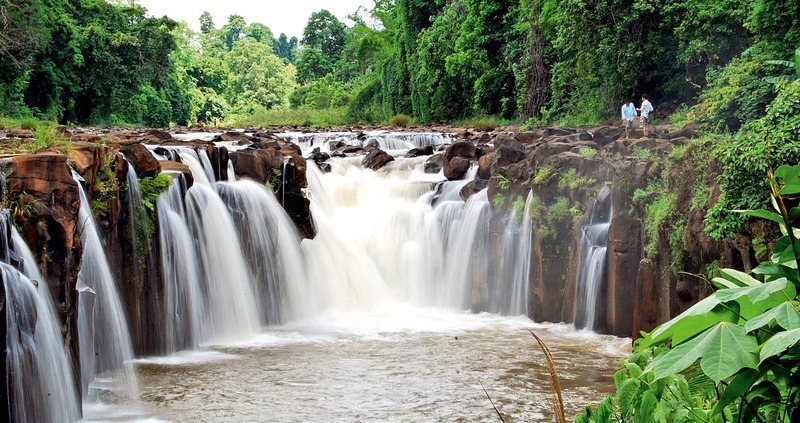 Khone Phapheng is considered the largest waterfall by volume in South East Asia; this is a really impressive near the Lao-Cambodian border, set within an area which is teeming with wildlife, making this area one of the most breathtaking destinations in Laos. Afterwards we drive back to Champasak to spend our last night in Laos at the beautiful The River Resort.